Celebs couldn’t believe all the rock royalty that surrounded them at last week’s 25th Anniversary Rock and Roll Hall of Fame Concerts October 29th and 30th at Madison Square Garden in New York City. 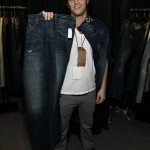 And they couldn’t keep their hands off of the Anoname and Cult of Individuality jeans in the gifting tent either! Designer Christian Siriano, Fergie (poor thing couldn’t even crack a smile despite free jeans in the midst of hubby Josh Duhamel’s alleged cheating with a stripper scandal), actor Mark Paul Gosselaar and many others scooped up their free pairs. Jealous much? Yes I am. Next articleLast Call – Twitter Contest: Win Paige Denim!